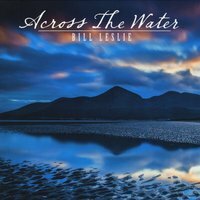 Bill Leslie has won numerous awards for his recordings over the years and it stands to reason that momentum will continue with the recent release of another instrumental classic titled Across The Water. Across The Water is a 12 track tribute to Ireland including 10 songs composed by Leslie and two traditional tunes. The album features superlative musicians performing on acoustic guitar, grand piano, violin, cello, oboe, accordion, Celtic whistles, flutes, harp, uilleann pipes and stand-up bass. The title track turns the page on the story that unfolds to a gracious and inviting introduction and from that point each track seamlessly blends into the next as the colors and textures change as the journey moves along. The combination of several instruments makes for a new age/world treat for the senses. “Gaelic Ghost” which was featured on the Rate The Tracks site, really sets the tone and atmosphere for the premise of this recording. If you are not recognizing the Celtic essences of this track you are either oblivious to the world around you or just ignoring the beauty that is enveloping you at the moment. This is all about the long lineage and history of the people that shaped a land far away from our shores here in the U.S. but also a reminder of the immigrants that helped to make our great country. I hear a longing and sadness and in the same instance a joyful remembrance of days long past in this music. The emotion and meaning found in these instrumental compositions are what stand out the most. "Irish Girl” framed it all for me with one listen. The precise piano playing, longing violin and enchanting flute give it a traditional feel helped along with today’s marvelous studio techniques and superb mastering. I think it’s safe to say that Bill Leslie has created yet another masterpiece that will garner plenty of attention on a global scale. Inside this music is history, tradition and a beauty that has been lost in our high tech society. If you are feeling numb, listless and need some culture and colorful sounds to brighten and enhance your day give this album a spin, it is likely to change your perspective on things that you never considered before. Thought provoking music has a way of doing that.